The Italians may never forgive me for this post, but it has to be said. You can make potato gnocchi from start to table in about 25 minutes with good quality dried potato flakes. There are benefits other than speed too. There’s no need to adjust the flour depending on the starch or water content of the potatoes. Plus, unlike the traditional method, your gnocchi won't turn gray if you don’t cook them immediately. They stay a beautiful golden color and can be frozen for later use. Oh, and did I mention they're about a $1.00 a batch to make? I may never slave over traditional gnocchi prep again. This gnocchi recipe utilizes a food processor, but can be made in a stand mixer with a paddle attachment instead. Each batch serves 2 to 3 people, but I double the recipe in my food processor for five. 2. Meanwhile, place the water, egg, butter, salt, garlic powder and parsley in the food processor. Process until combined. Add the flour and pulse to mix in. Add the potato flakes and pulse to combine. 3. Move dough to a clean surface and knead for about 20 seconds. Grab chunks of dough and form into snakes. Cut 1/2 inch wide pieces from snakes and roll each piece into a ball with a fork. Pull the fork back toward you for a roll or two to make gnocchi shape. 4. Gently boil gnocchi until they float to the top and then cook for two more minutes. Remove gnocchi with a slotted spoon and serve with your favorite sauce. Original recipe source from About.com. Adapted by Laura Flowers for a one bowl method. Picture by Laura Flowers. Hey, whatsa matta you? Taking such short cuts. Just kidding - nice trick. Ya done good, kid. OMG that is great! I have yet to be successful with gnocchi. Don't worry we will forgive you. These are just too gorgeous not to forgive. they look greaT! ive nver made gnocchi but that will have to change. I always make mine with instant potatoes, such a breeze and so delightfully light and fluffy. They are one of my favs. i'll be honest with you...I'd be angry...but...it took me about 8 hours to make my first batch of gnocchi. So these are basically a godsend. I've done this before and they taste JUST as good! Super yummy! O my god this just made me laugh! I've only ever made a true gnocchi in the home of an Italian chef and I am sure she would not be thrilled to read this post of yours, but I find it brilliant! I've never made gnocchi at home as well, all that works just didn't seem worth it. I like gnocchi but I don't like them that much.. Now I have no more excuses! Brilliant! I always wondered if it would be possible but having a recipe really helps! Cheers. Awesome. I don't care if the Italian gods would frown on this. Unless they're willing to make this for me on demand for free, I'll take the easiest way to make these. This is...the best idea ever!!!! I love how easy it is. This is saved for sure. What an awesome idea. Always wanted to try gnocchi. Hmmm.. i have discovered the Hungry Jack's Yukon Gold and Redskin potato flakes are quite easy, tasty, and just the right texture, i will have to try this!! How in heck did you make a plain old gnocci look so wonderful??? Oh, awesome. Thank you for this! My sister had a temporary obsession with mashed potatoes, but she was too lazy to make them from scratch - boxed mashed potato flakes, GAG. Unfortunately her obsession passed before she opened her last box, so it's been sitting waiting for a food drive or someone annoyed enough to put it in the trash. Fortunately ! you've just saved its pitiful life. From terrible cardboard mashed potatoes to glorious, beautiful gnocchi! That's a great tip! Your gnocchi looks fabulous! Wow, I've never heard of this method! Maybe I'll actually try making gnocchi now! Gnocchi has so far intimidated me but I think my first batch will be the shortcut way! Thanks for the recipe! I've always wanted to make gnocchi from scratch, but I've been so intimidated. I think I could give this one a go!! Why did I not know you had a blog?! Thanks for commenting on mine so I could discover yours. How funny that you made gnocchi since I've been thinking about learning to make it for a long time. You make it look easy. These look incredible! I tried to make gnocchi the other week, but they didn't turn out so well. I need to give your version a try! I'm so glad to have found this idea on Tastespotting. I have a half bag to use up andthiswill be perfect. Thank you SO MUCH for this recipe. I tried to make gnocchi from scratch once, and just kind of gave up after cooking the potatoes. 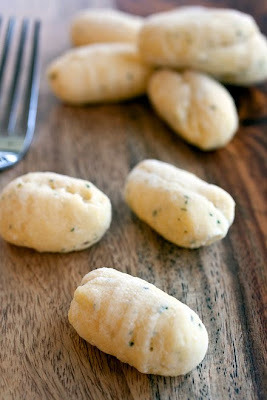 It took me literally less than 2 minutes to make this gnocchi dough with my kitchenaid. Definitely quicker than my previous attempt, and any other I would've tried. If anyone's curious about trying this, IT WORKS. JUST DO IT. STOP READING.